The CA-D31N D Series Clamp Meter for oscilloscopes has a high-quality iron core with evenly distributed windings. This allows accurate AC current measurement, even at currents up to 3000 A. Due to the rectangular shape, the Clamp Meter is particularly suitable for busbars and cables with a large cross section. The Clamp Meter adapter comes manufacturer calibrated with ISO calibration as an option. The CA-MA200-35 Mini Clamp Meter can measure AC currents from 0.5 A to 3000 A with a 1 MHz bandwidth, and features a BNC connector for oscilloscopes. Whether the current is to be measured in control cabinets, junction boxes, or on tracks, the miniature CT MA 200, with its flexible current loop, is a way to measure the current with a bandwidth of 1 MHz. Thanks to the BNC output of the miniature CT MA 200 it may be directly connected to an oscilloscope. The test meter comes manufacturer calibrated with ISO certification as an option. The CA-D37N D Series Clamp Meter for oscilloscopes has a high-quality iron core with evenly distributed windings. This allows accurate AC current measurement, even at currents up to 3000 A. Due to the rectangular shape, the Clamp Meter is particularly suitable for busbars and cables with a large cross section. The Clamp Meter adapter comes manufacturer calibrated with ISO calibration as an option. The CA-D32N D Series Clamp Meter for oscilloscopes has a high-quality iron core with evenly distributed windings. This allows accurate AC current measurement, even at currents up to 3000 A. Due to the rectangular shape, the Clamp Meter is particularly suitable for busbars and cables with a large cross section. The Clamp Meter adapter comes manufacturer calibrated with ISO calibration as an option. The CA-D34N D Series Clamp Meter for oscilloscopes has a high-quality iron core with evenly distributed windings. This allows accurate AC current measurement, even at currents up to 3000 A. Due to the rectangular shape, the Clamp Meter is particularly suitable for busbars and cables with a large cross section. The Clamp Meter adapter comes manufacturer calibrated with ISO calibration as an option. Current transformers for process streams up to max. 4.5 A, 3.9 mm diameter pliers, for multimeter. The Clamp Meter for multimeter from the K Series is used to direct and measure alternating currents precisely. 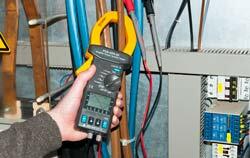 The field of application of this Clamp Meter is where very small currents need to be measured. Thus, the Clamp Meter is used to process streams of control technology in the range of 4 ... 20 mA. The test instrument (as all instruments) comes manufacturer calibrated (ISO certification as an option). The CA-D35N D Series Clamp Meter for oscilloscopes has a high-quality iron core with evenly distributed windings. This allows accurate AC current measurement, even at currents up to 3000 A. Due to the rectangular shape, the Clamp Meter is particularly suitable for busbars and cables with a large cross section. The Clamp Meter adapter comes manufacturer calibrated with ISO calibration as an option. The 4-caliber Clamp Meter from the C1XX series for multimeters has a diameter of 52 mm (2.0 in), maximum 1000 A AC, and is designed for power and harmonics measurement. The 4-caliber Clamp Meter can be connected via 4 mm (0.2 in) safety plugs to a multimeter. It is also possible to connect the 4-caliber Clamp Meter via the 4 mm (0.2 mm) sockets or the BNC connector to a data acquisition system. The test instrument comes manufacturer calibrated. As all instruments, it can be certified to ISO as an option. The CA-D38N D Series Clamp Meter for oscilloscopes has a high-quality iron core with evenly distributed windings. This allows accurate AC current measurement, even at currents up to 3000 A. Due to the rectangular shape, the Clamp Meter is particularly suitable for busbars and cables with a large cross section. The Clamp Meter adapter comes manufacturer calibrated with ISO calibration as an option. The CA-B102 Clamp Meter is designed for fast location of insulation faults. The Clamp Meter has a maximum diameter up to 112 mm (4.4 in), and can be used with multimeters. Two selectable measuring ranges are available to allow for precise measurement according to DIN VDE 010.